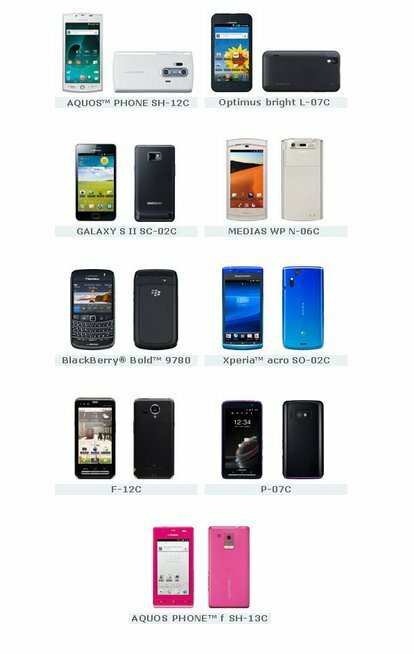 Japanese carrier NTT Docomo has announced its summer 2011 lineup, which includes nine smartphones -- eight of which are Android. The offerings from Sharp, NEC, LG, Samsung and Sony Ericsson are chock full of cool features that never seem to make it out of Asia, like infrared data exchange and mobile wallet. Even more interesting is that they all will ship with Gingerbread, another feature that seems slow to make it's way to North America. We've already seen the Xperia Acro, will launch in June or July, and the summer fun kicks off on May 20 with the Sharp AQUOS SH-12C, which is billed as an "Android smartphone with 8.0-megapixel 3D twin cameras. LCD panel and image processor based on AQUOS technology for high-resolution images." Hit the break to see the smartphone portion of NTT Docomo's press release, and the source link for more information. compatible with DOCOMO’s i-mode™ mobile Internet platform, as well as mobile Wi-Fi® routers for DOCOMO’s Xi™ (read “Crossy”) LTE extra-high-speed service. The smartphone lineup offers user-friendly features for tethering, mobile-wallet (Osaifu-Keitai™) and infrared-based data exchange, plus downlink speeds up to a theoretical maximum of 14 Mbps starting from early June. The lineup also boasts the world’s first wirelessly chargeable smartphone. All Android™ smartphones, including the globally popular Xperia™ and GALAXY models, are preinstalled with Android 2.3. Smartphones offering enhanced convenience and operability thanks to the new “docomo Palette UI” feature for easy sorting, searching and management of apps. The i-motion™ video-clip distribution service for FOMA™ 3G feature phones now offers 50 MB capacity for both long and high-definition video. Batch downloads of various content are possible with DOCOMO’s new “content package” service. Two mobile Wi-Fi routers compatible with DOCOMO’s Xi-brand LTE service, offering fiber-optic-level mobile connectivity for wireless devices. LTE service will include Japan’s six largest urban metropolises by July and other large cities including prefectural capitals by March 2012. AQUOS™ PHONE SH-12C May 20 Android smartphone with 8.0-megapixel 3D twin cameras. LCD panel and image processor based on AQUOS technology for high-resolution images. Optimus bright L-07C Mid June Equipped with a world’s brightest display*. Body is 9.5 mm thin and weighs only 112 g. Interchangeable rear cover comes in 3 colors. GALAXY S II SC-02C Late June Android smartphone with 4.3-inch SUPER AMOLED Plus display. Powerful 1.2 GHz dual-core CPU enables fast app launches and stable video. MEDIAS WP N-06C June or July Waterproof Android smartphone in world’ first 7.9-mm body**. Mobile wallet, infrared-based data exchange andone-seg TV. Premium model designed with appliance brand amadana. Xperia™ acro SO-02C June or July Android smartphone with mobile wallet, infrared -based data exchange and one-seg TV features. 4.2-inch “Reality Display” delivers brilliant, crystal-clear images. F-12C July or August Android smartphone features Bright Color Liquid Display and voice-enhancement capability for extra-clear audio. Designed in collaboration with luxury luggage brand Globe-Trotter. P-07C July or August Stylishly beautiful Android smartphone with 4.3-inch touchscreen. Screen position of keypad and touch-speed selector can be customized for easy one-hand operation.